Click Download File below to preview the appropriate document. 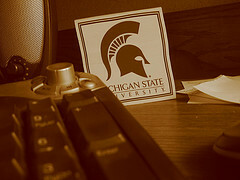 I was fortunate enough to be able to take this class twice during my coursework at MSU. Each course was taught by a different professor. I chose to take the course twice because I recognized how important and vastly different peoples opinions are in the area of design. I felt as though these were the classes that most profoundly changed my way of thinking and interacting with the Internet and online content. The projects you see below are a book review on Everything is Miscellaneous by David Weinberger (I recommend it for a good read to make you think about order), notes for my final podcast, a 55 fiction assignment (a short story told in exactly 55 words), my aesthetic philosophy, and a visualization of people that I consider my contacts. I feel design courses by nature make you think about why things are the way they are. It makes you want to analyze something further or at least take more time to think about it. Design courses allow you to view some items through the eyes of others which in turn boradens your perspective. I highly recommend taking a design course (if not all of them). They put you in touch with the world around you.